A photo gift makes a great alternative to a bow. 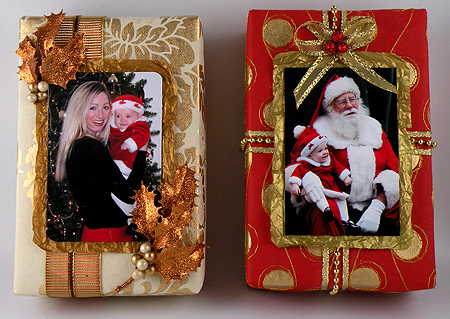 You can attach a holiday picture of each recipient to the top of the gift. Not only will it be a nice addition to the present but it will also make it easy to distinguish who gets each gift. This is especially nice if you have a tree surrounded with lots of presents. This entry was posted in Everything, Gift Wrapping, Recycle and tagged gift wrap, Gina Tepper, Photo Gift Wrap, photos, recycle, wrapping with photos. Bookmark the permalink.